Vetting potential pay-per-click partners? Don't go it alone! 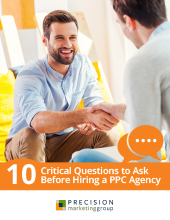 Use the questions in this complimentary guide to find your perfect PPC marketing match. So many small and mid-sized companies today are experiencing the value of a reliable stream of leads and new business generated using pay-per-click (PPC) advertising on Google, Bing, LinkedIn and Facebook. The difference is often due to the skill level of the PPC agency or consultant with whom they’re partnering. So how can you go about finding a good, dependable agency for your company? Red flags to avoid... and more. It's important to feel confident in a new business partnership! Find out what you need to ask a PPC candidate before you decide to move forward with the engagement. Simply fill out the brief form and receive our free guide now!